See modern Dubai in style on a private 11-hour trip from Ras Al Khaimah. Take photos by the Atlantis, The Palm on the Palm Jumeirah archipelago, and stroll by skyscraper-framed Dubai Marina and the palm-lined canals of Souk Madinat Jumeirah. Then, ride the elevator to the Burj Khalifa’s 124th-floor observatory to enjoy the bird’s-eye views. Finish with a drink at the Skyview bar at the 7-star Burj Al Arab before returning to Ras Al Khaimah. If you’re in Ras Al Khaimah, this teams a new Dubai tour with Burj Al Arab drinks, in one easy private trip. Meet your private guide at your Ras Al Khaimah hotel and drive to Dubai, famous for its futuristic architecture and opulent hotels and malls. Take the undersea tunnel to the Palm Jumeirah, the artificial palm tree-shaped archipelago jutting into the Arabian Gulf. View the plush villas along the ‘fronds’ and drive along the outer breakwater to take photos by Atlantis, The Palm: the colossal luxury hotel that is the archipelago’s showpiece. Wander by the traditional-style wind towers and palm-lined waterways, dotted with abra water taxis that carry hotel guests to their rooms. Plus, see the intricate wooden arcades of the Souk Madinat, home to a host of upscale shops. 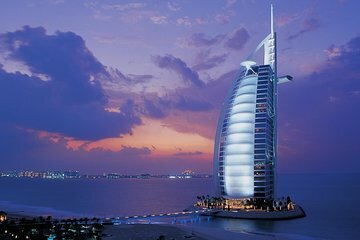 Admire the stunning views of the sail-shaped, 7-star Burj Al Arab from here before visiting Dubai Mall and the Burj Khalifa, the world’s highest tower. Ride the express lift to the 124th-floor observatory at 1,483 feet (452 meters), and drink in the 360-degree city views. Back at ground level, see the fountains at the Burj Lake, and then drive to the Burj Al Arab. Marvel at the soaring atrium and catch the glass elevator to the Skyview cocktail bar on the 27th floor. Relax over a drink from the bar list (up to an approximate value of USD $95) as you take in the panoramic sea and coastal views from 656 feet (200 meters) up. Your tour then ends with a drop-off at your Ras Al Khaimah hotel.